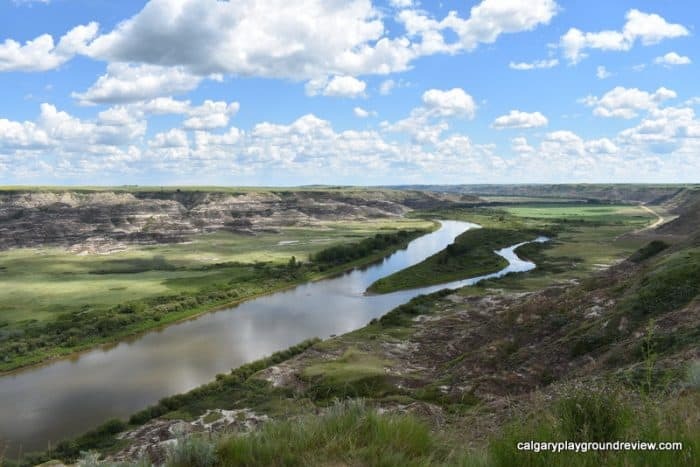 Disclosure: In order to facilitate these reviews, we were provided with accommodation in Drumheller, and admission to the Royal Tyrrell Museum and Atlas Coal Mine. Thank you to Travel Alberta for facilitating our trip! You don’t have to go far to have a fun filled family vacation. 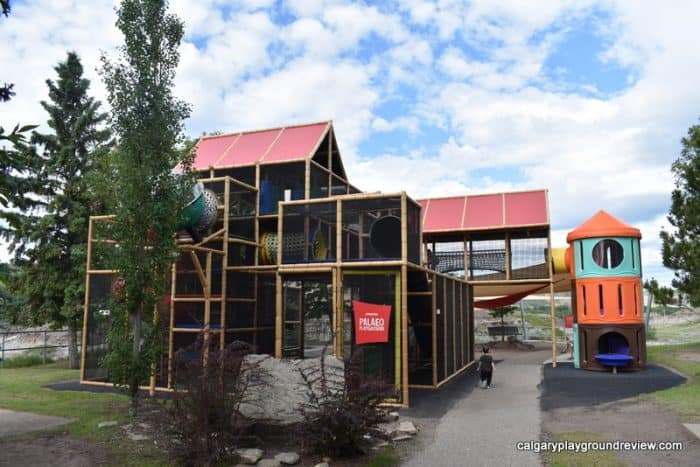 We’ve been exploring Alberta to check out the family friendly attractions that are right in our own backyard. 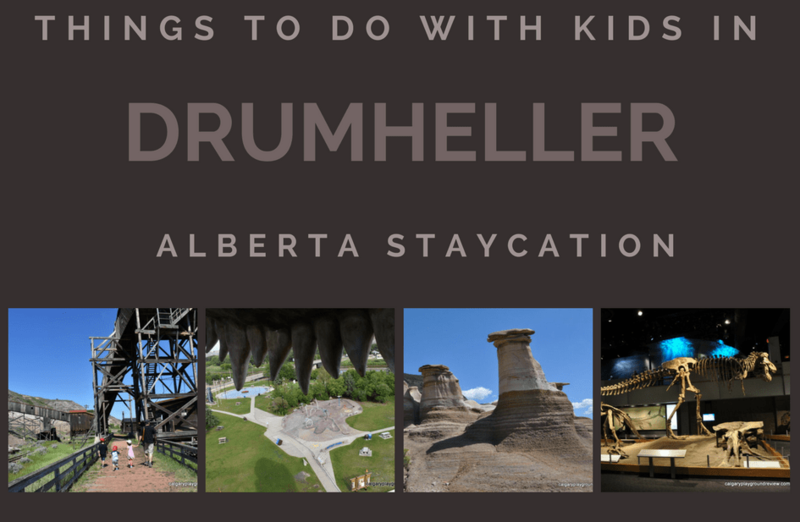 Drumheller is only a 90 minute drive from Calgary making it a perfect distance for a day trip or a near-vacation. 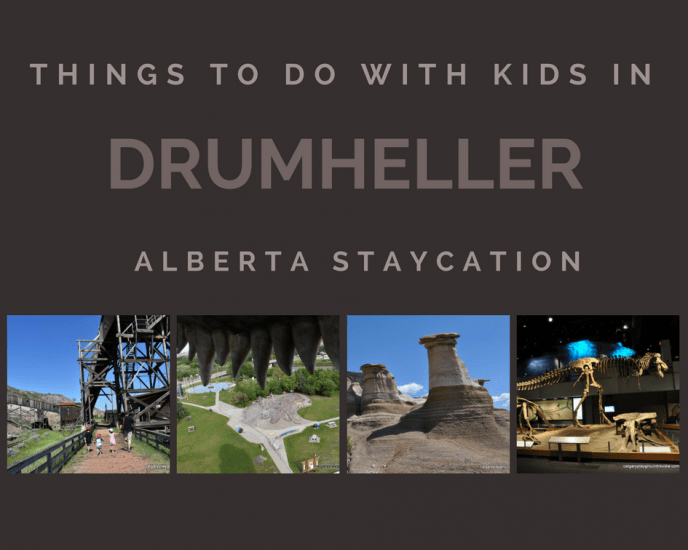 Drumheller is filled with family-friendly things to do and see. Here are some of the things that you won’t want to miss! 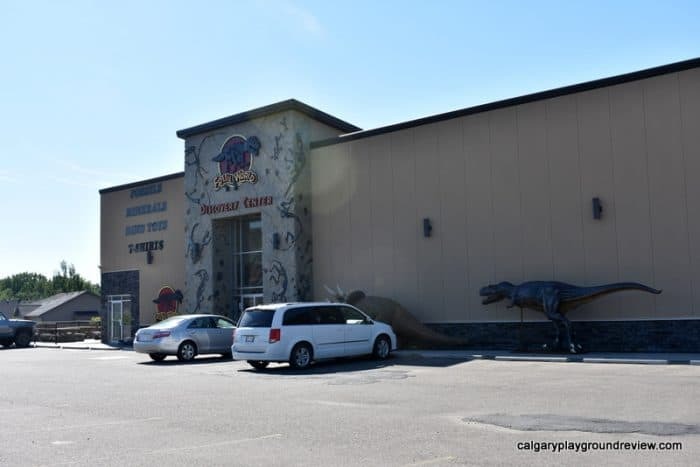 Located at Drumheller’s tourist information centre, the World’s Largest Dinosaur is pretty hard to miss. At 25 meters tall, the T-Rex is even taller than an actual T-Rex would have been. It costs $10.50 for a family to go up and the experience is pretty short (and requires a lot of stairs). However, the trip up is well decorated and it was one of the highlights for my kids. 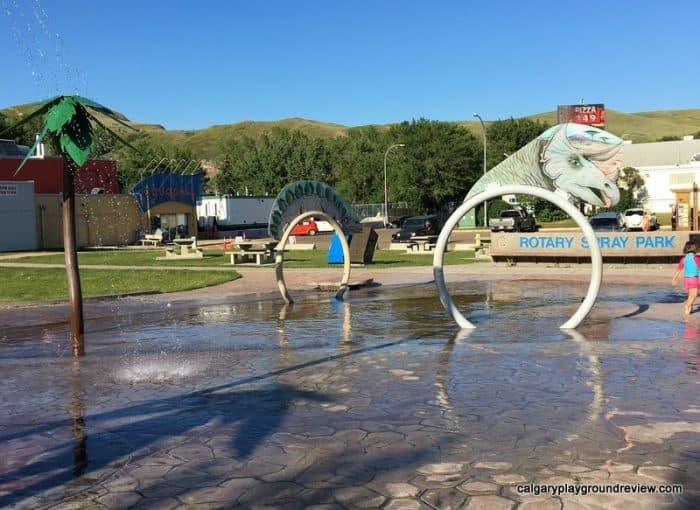 Located right next to the World’s Largest Dinosaur (as well as the Aquaplex), the dinosaur themed spray park and fountain is free to access and typically open from the May long weekend until Mid-September. 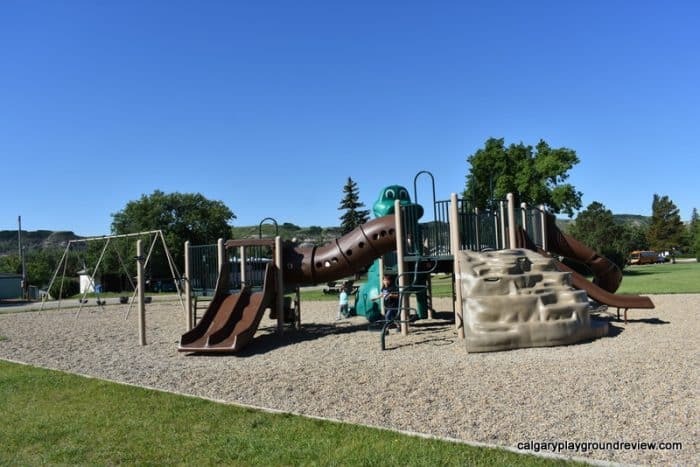 The spray park is on a bit of a slope – my 5 and 8 year old has no trouble navigating but my 2 year old found it hard to keep his footing. 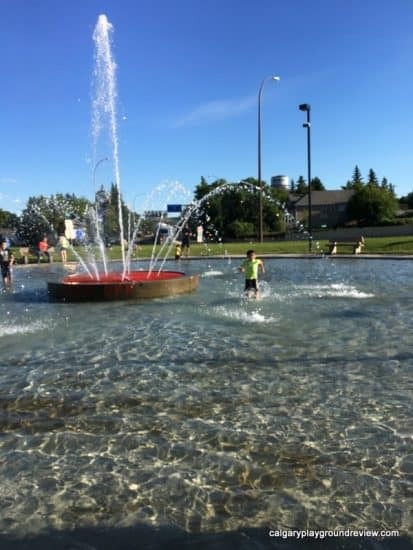 All my kids adored the fountain wading pool though and said it was one of the best parts of our trip. 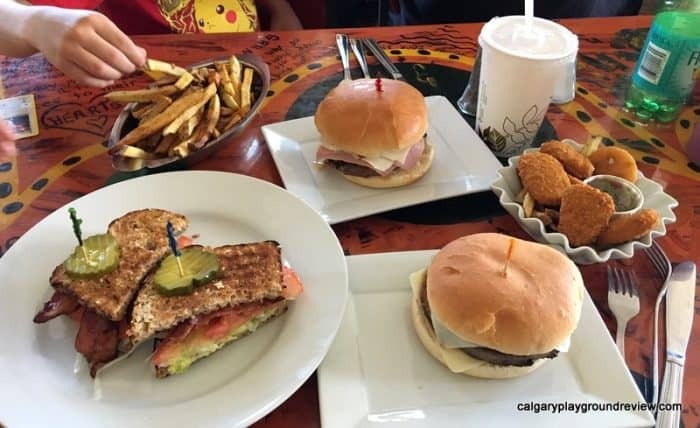 Bernie & the Boys is a quirky little restaurant that is very family friendly. 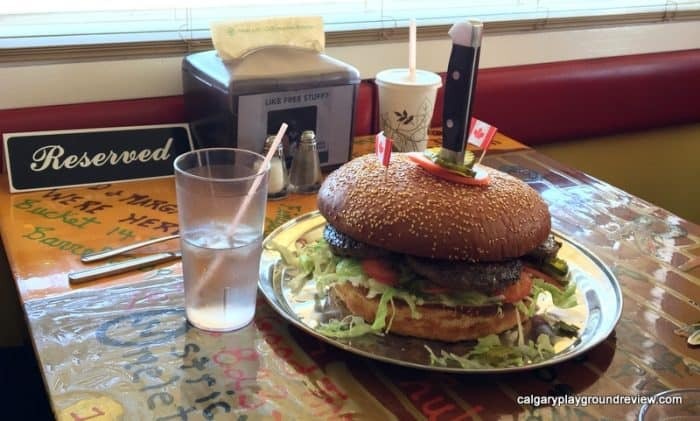 They are known for their unique burgers (including the Mammoth Burger below) and long list of milkshakes but you can also find pasta, sandwiches and subs. 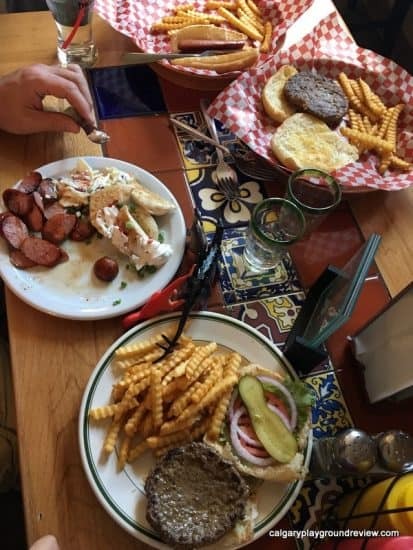 Don’t worry if you see reserved signs on empty tables – that’s their way of making sure people order before they sit down. Their fries are especially delicious and if you order a family size it comes in a bucket! 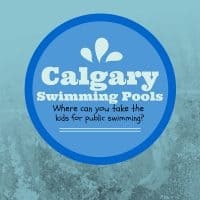 Kids need to burn of some energy before or after dinner? 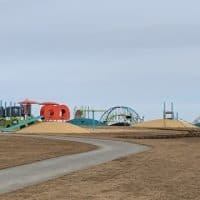 The Little Explorers Playground is located just across the street from Bernie & the Boys and is open to the public on evenings and weekends. One of the other things my kids loved is spotting dinosaurs all over town. This is a great activity in the car or on foot. 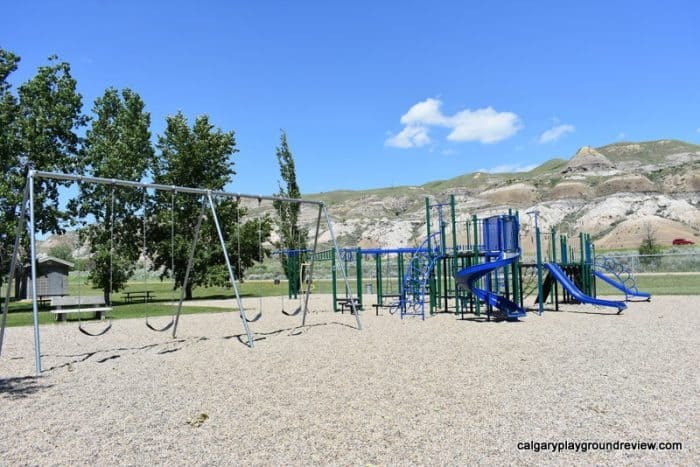 Many of them also double as pokestops/gyms on Pokemon Go making Drumheller a great place for playing that as well. You can find a map with some of the dinos here. 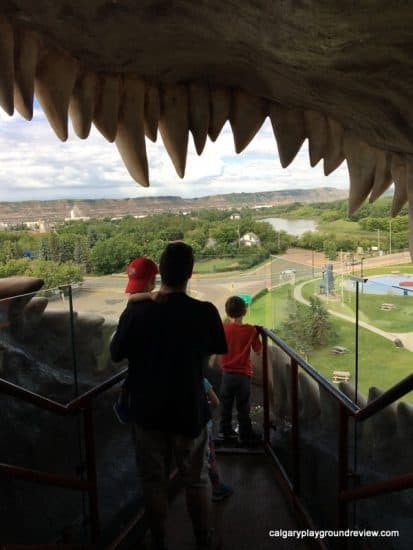 Drumheller’s biggest attraction is worth it’s reputation. Expect the museum to take around 2- 3 hours. They have a cafeteria on site but it is not exceptional so you may want to consider bringing your own. The museum is set up in two main sections. The first half is a little more interactive for kids with things they can touch low down to the ground. The 2nd half takes you on a trip through time featuring their fantastic fossil collection. 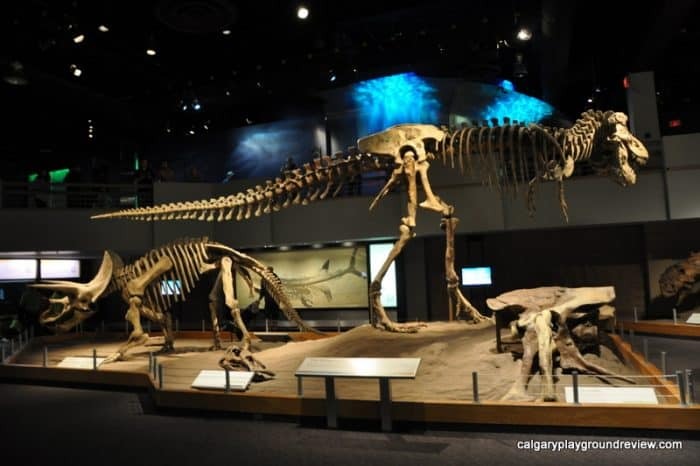 You can now get an audio tour for free by downloading the Royal Tyrrell Museum app on your phone. 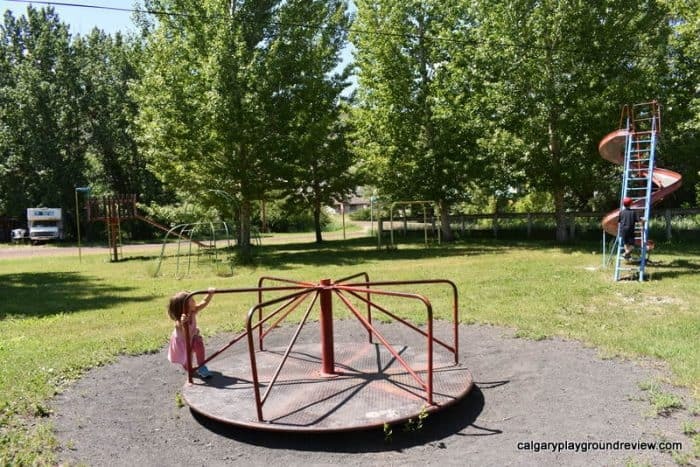 Located just outside the Tyrrell Museum is this muli-story playground. 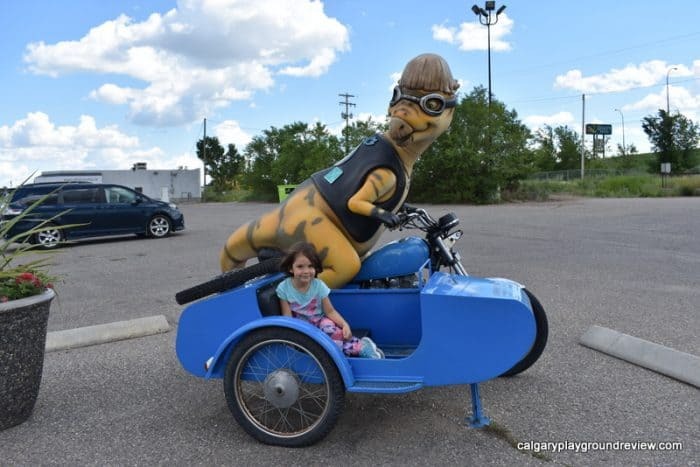 It is free to visit and even has a dino dig (and a sunshade!) at the back. 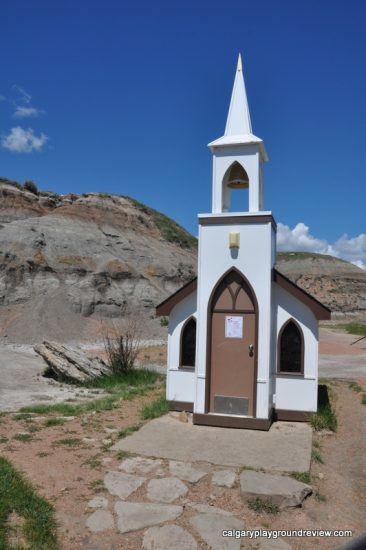 Just two minutes from the Royal Tyrrell, the Little Church was designed as a place of meditation and worship, not just as a tourist attraction. It sits 6 at a time, and you are able to go inside. There was a sign up on the door while we were there saying it was going to be used for a wedding later that day. 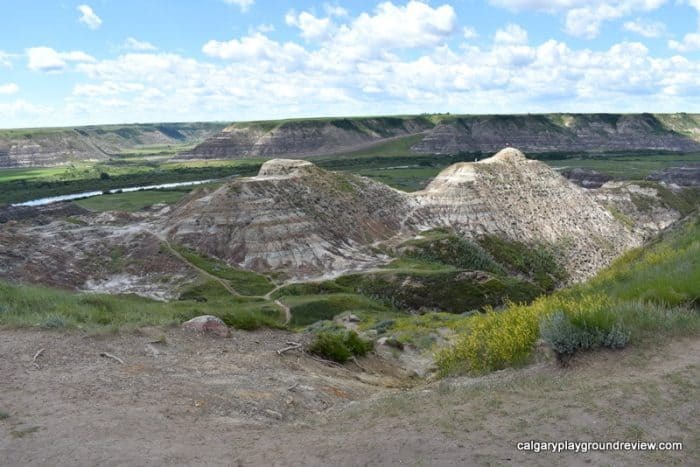 One of two similarly named canyons near Drumheller. This one is located along the Dinosaur Trail loop to the North West. The views from the lookout point are amazing and well worth the stop. 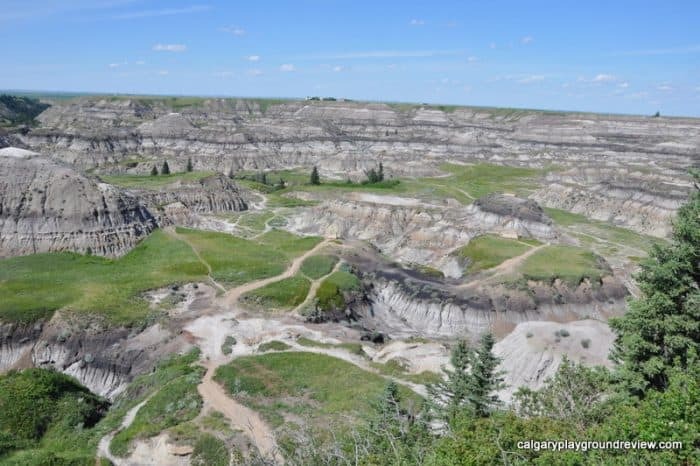 Although there are no official trails, if you are feeling more adventurous, you can hike down to the peaks inside the canyon. There are two worn pathways down, the more obvious is straight ahead of the parking lot. To the left you can find a more gradual path that will be a little easier. The hike is fairly challenging considering how short it is. Some sections are fairly steep and the ground can be a bit crumbly. 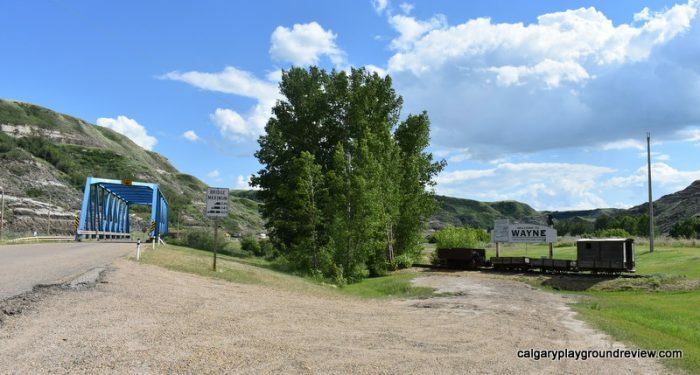 From Horsethief canyon you can continue along the Dinosaur Trail loop to the Bleriot Ferry. 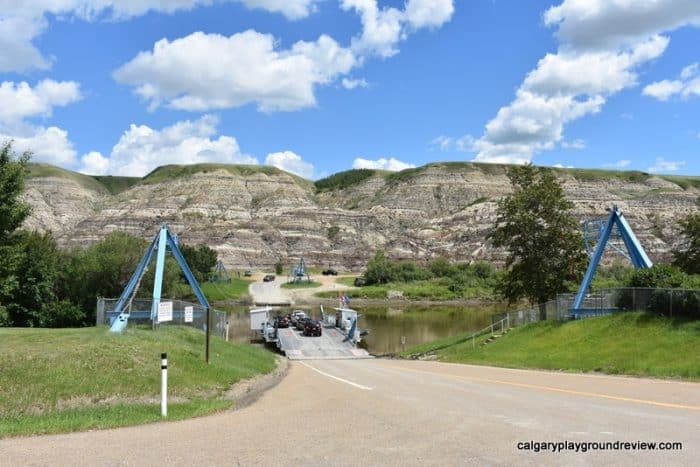 The ferry is free to ride (and seasonal) and takes you on a short distance across the Red Deer River. It is representative of the numerous ferries that once helped people cross the rivers in the region rather than the bridges you find now. You may also want to stop at the Orkney Viewpoint before you get back to town. Midland Provincial Park is right nearby the Royal Tyrrell Museum. When you enter the park the road forks. If you go straight ahead you’ll find the old office and a short walk with some interpretive signs across the road. If you go to the right you’ll find a interpretive walking trail through the old mine area. Most of the Mine is now completely gone but some artifacts remain and it’s a nice walk. 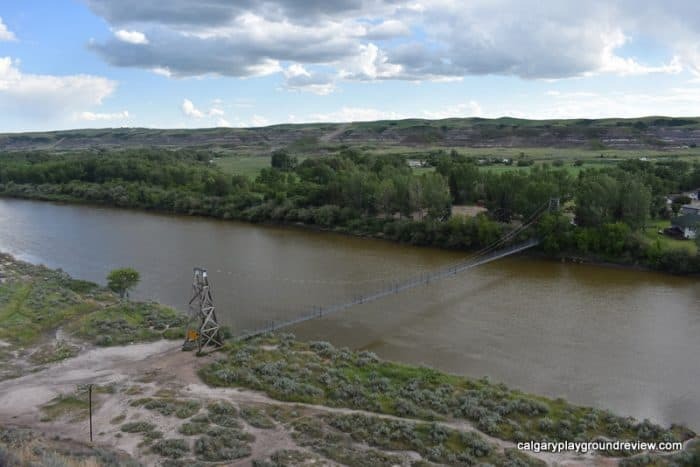 The original suspension bridge was used as part of the Star Mine Operation. 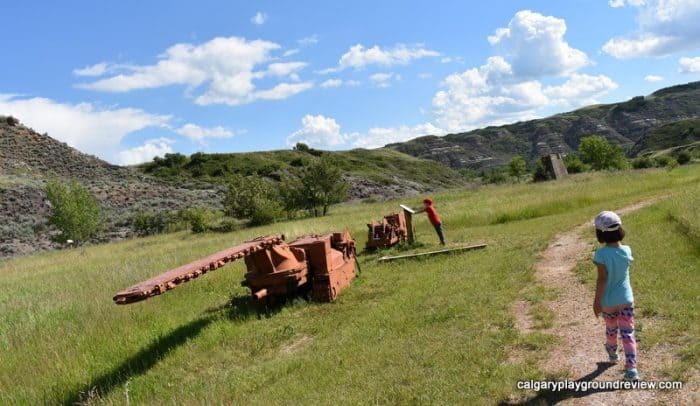 It was rebuilt in 1958 to commemorate the Drumheller area’s mining history. It is 117 meters long (and feels longer!). It is totally worth walking across but it is a little eerie as you can see straight down and the bridge moves a bit. 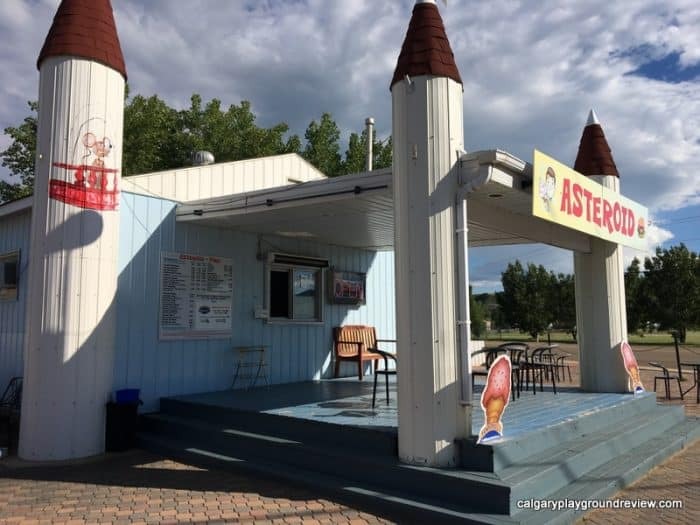 Also located in Rosedale at Asteroid you can find hot items like burgers and fries as well as a good selection of ice cream. They have a nice seating area beside the restaurant. Cash only. You can cross 11 bridges in only 6km on your way to the now very small town of Wayne. The kids loved counting the bridges and after the 9th bridge you’ll find yourself at the Last Chance Saloon where you can stop for a drink or some food. You can continue on for two more bridges and then turn around and do it all over again. Watch out as you cross the bridges as most of them only have room for one way traffic. 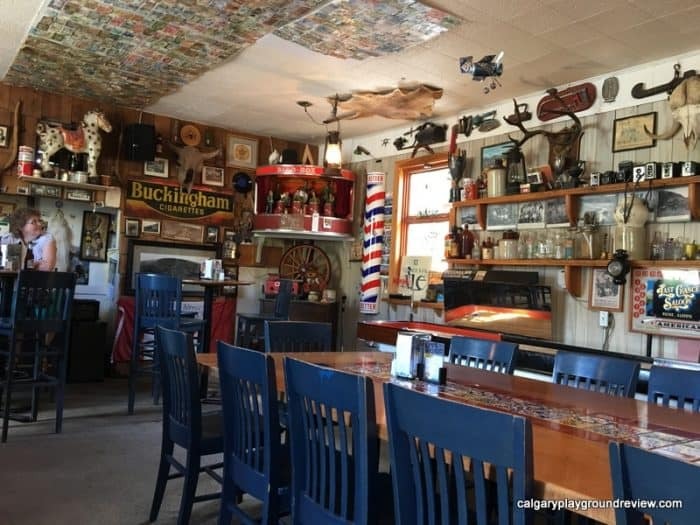 If you are looking for a restaurant with some local flavour, you can’t do better than the Last Chance Saloon. Even if you only stop for a drink, the inside covered in interesting artifacts. 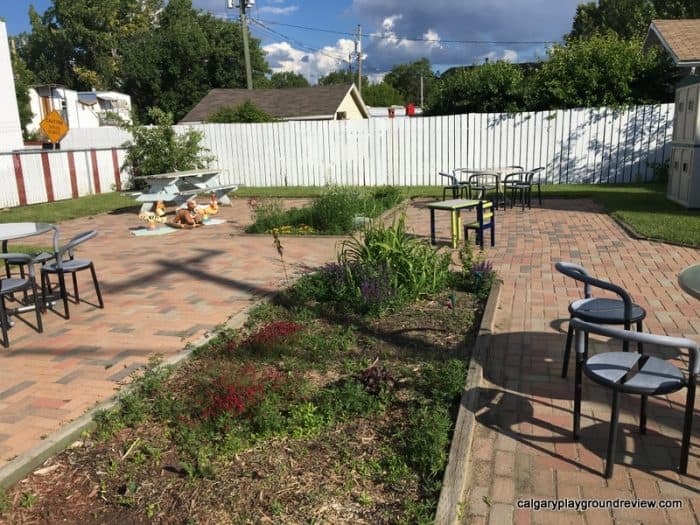 If it’s a nice day, you can find some seating outside as well. 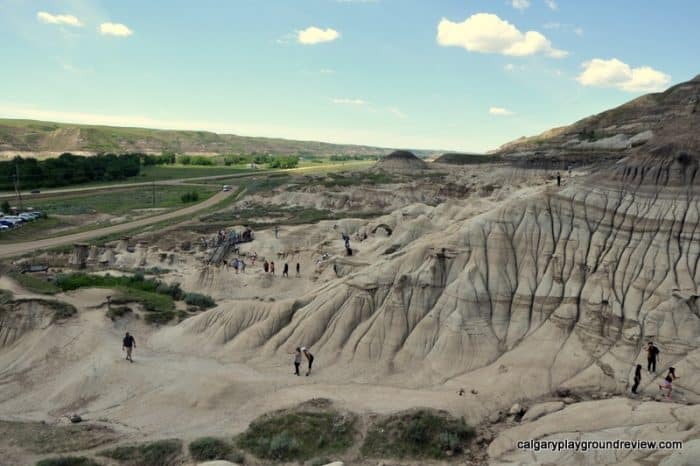 The best place to see the iconic hoodoo formations are at the Hoodoo trail, midway between Rosedale and East Coulee. 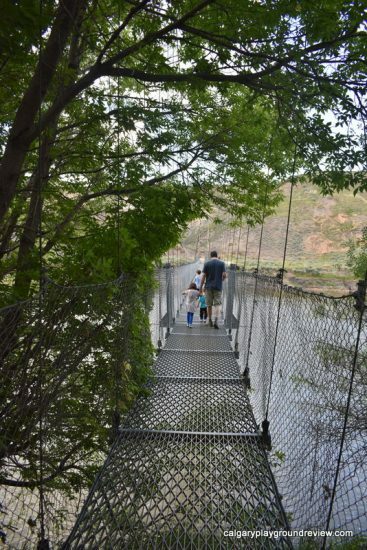 A boardwalk surrounds the protected area in the middle where climbing is not allowed. The walk is fairly easy but not stroller friendly as there are a few sets of stairs. You can still get a good look at the hoodoos even if you want to stick to level ground, however. 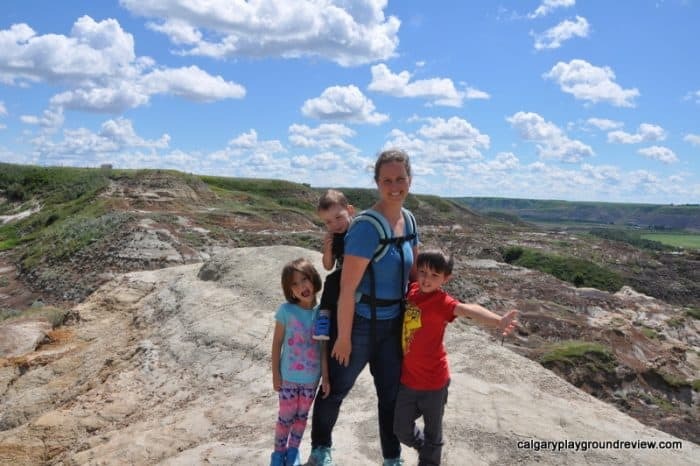 If your family is keen on climbing you can scale the sandstone cliffs beyond the boardwalk. My older kids loved this challenge, however my 2 year old preferred to stick to smaller obstacles. Keep in mind this area can be quite hot and the sandstone can be slippery. 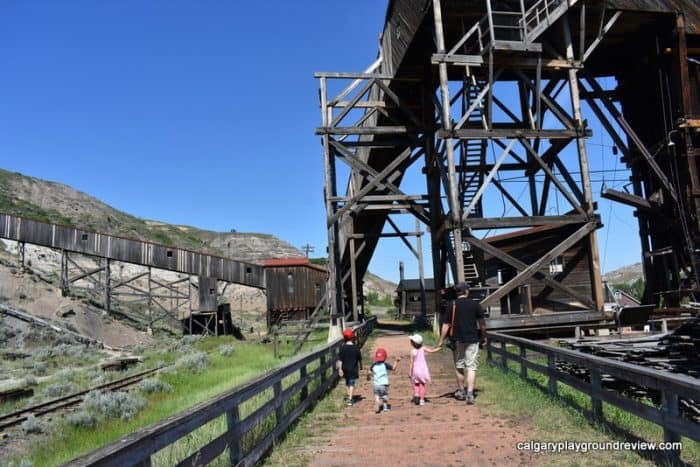 Located next to East Coulee, Atlas Coal Mine is considered the most complete historic coal mine in Canada. 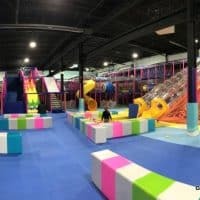 It’s really a unique experience and I would consider it well worth a visit. Plan your visit around the tour schedule. You can get tours up the tipple as well as an underground tour. With general admission you get a ride on the train – check the train times so you don’t miss out. We lucked into catching the train as soon as we arrived. 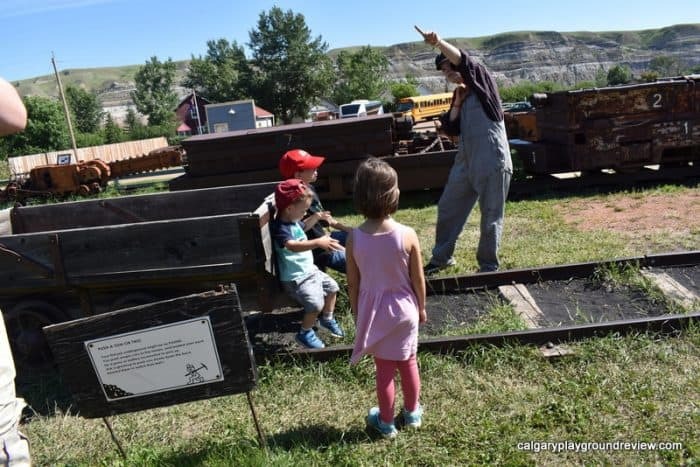 Not only did we get to ride in an old coal train (to the delight of my train loving kids), we were informed and entertained by our enthusiastic and engaging tour guide. We were then able to go on a self guided tour of the mine. It was really interesting to get a glimpse into what it would have been like to work at one of these mines. After leaving Atlas Mine we were ready for lunch so headed over to the East Coulee School Museum’s Tea Room. The food consisted largely of simple sandwiches but they were prepared to order and it was just what we needed. 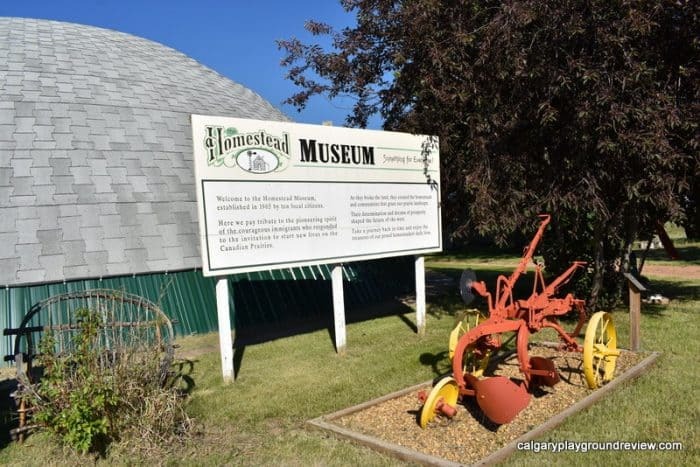 We checked out the Museum while we were there – I would recommend saving it for a rainy day, but the old school room and the mining history room were interesting to see. The kids really loved playing on the vintage playground equipment outside though. 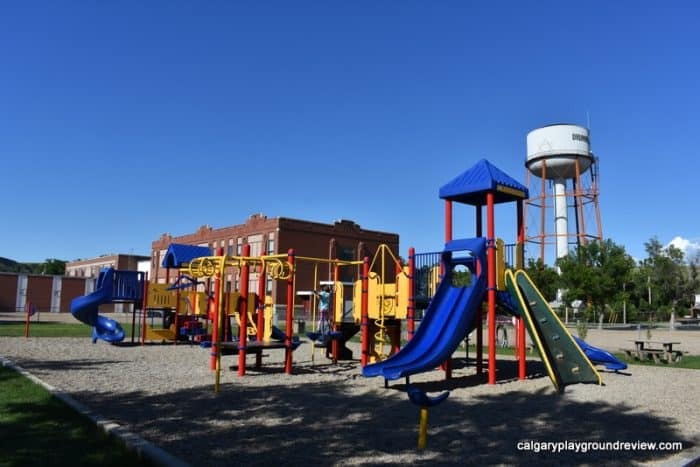 Located to the North of East Coulee school (1st avenue and 3rd street), you can find this more modern playground. 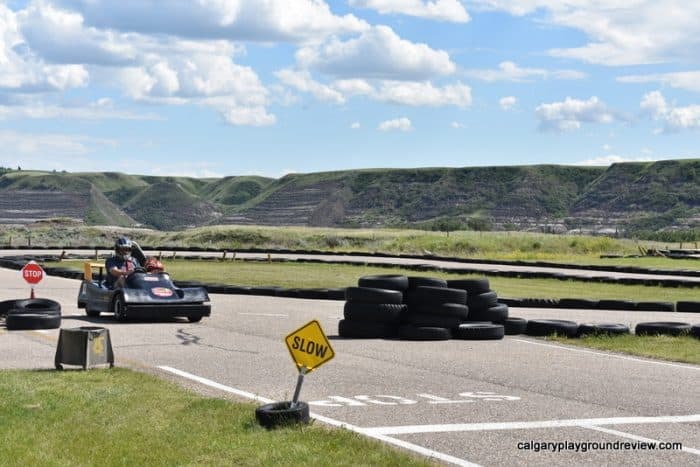 Cactus Coulee has a few activities including a Euro-bungy and a couple of mini golf courses, but the main draw is obviously the go-karts. 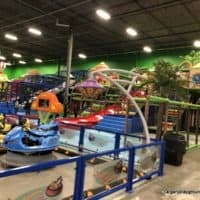 They have three kinds of karts: a regular kart, a double kart and a junior kart for kids under 14. My kids were all too short to ride by themselves (52″) so my husband rode 5 laps with each of them in a double kart. They all loved it and my oldest can’t wait to go back when he is tall enough to ride solo. Fossil World Discovery Center bills itself as a hands on, interactive museum for kids. They have a small museum, kids play area and animatronic dinosaurs. Fossil dig and mineral mine are extra. 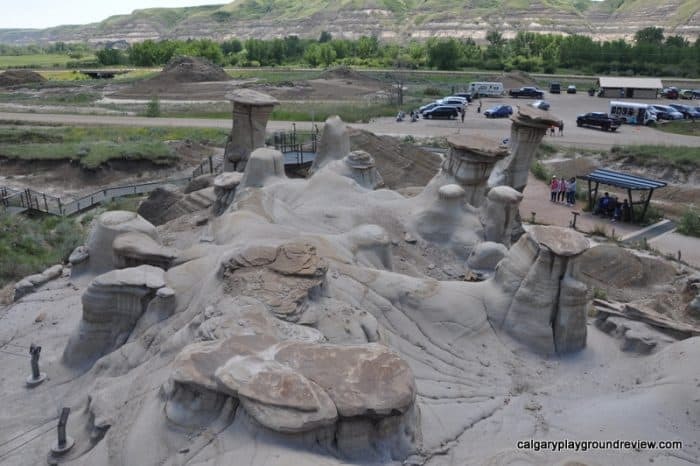 We didn’t get a chance to check it out while we were in Drumheller this trip – have you been? Let us know what you thought. 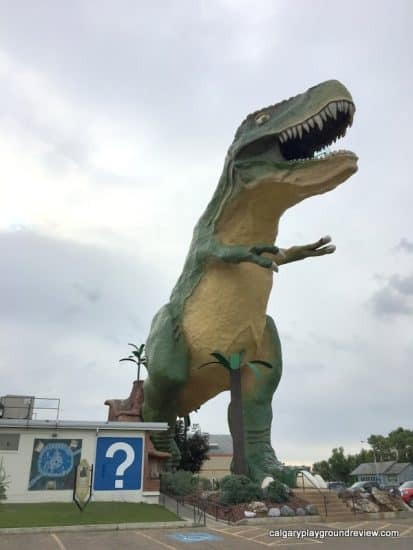 Right next door you can find this dinosaur themed playground. My oldest saw this museum while we were driving and really wanted to check it out. We ended up there too late, but the kids still enjoyed taking a look at the machinery and vehicles outside. 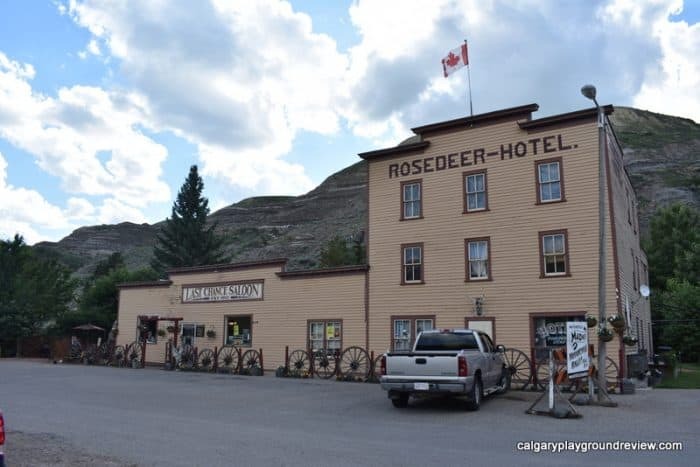 A great stop on the way to Drumheller or on the way back to Calgary. The views from the top are amazing. If you are looking for a hike this would be a great place to go. Unfortunately the steep steps down into the canyon were closed when we were there, so we just took in the view. (Also, despite what google may say, there is no interpretive centre here). 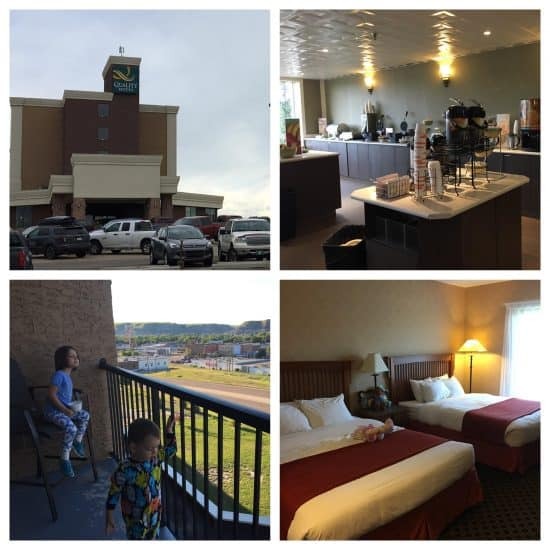 We stayed at the Quality Hotel Drumheller for our trip. It is centrally located making it easy to get to all of the regional attractions. We found our stay to be clean and comfortable and appreciated the free continental breakfast in the morning. It also has pet friendly rooms so you can easily take a vacation with your whole family.